My husband and I have long term projects we want to take on with our house. I'm going to make curtains for our windows and he's going to repaint all the doors. The hubs first peeled and chipped the paint off. We found out the house was once yellow, green, teal, and sky blue before this final sand and white color. He used a scraper and paint remover to do most of the heavy work. 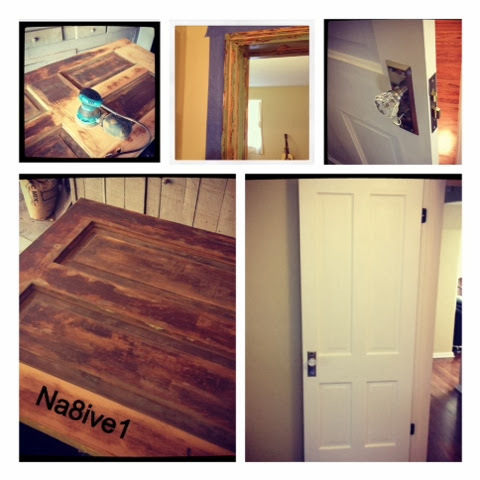 Next, he sanded down the door using a circular sander and a Dremel for the detail work in the grooves. After that, he applied 2 coats of paint and primer to the door. He bought new knobs and a working lock for the door, updating the look of the door, and new hinges since the previous owners painted over the old hinges. He also repainted the door frame, paying the same meticulous attention to detail. He really got into the grooves to peel/chip out all the layers of old paint before sanding off the burrs. The triumphant result is a frame and door that has definition in the detail, a fresh coat of white paint, quiet hinges, and an actual lock that works. The door is as old as the house, over 80 years old, but it looks refreshed. It has a modern feel while still retaining it's aged elegance! I have loved watching my husband take on this project. One door down, six more to go, Honey!! Photos courtesy of the hubs' Instagram. Follow him on Instagram at Na8ive1.